Most recently Jean Vanier has been awarded the 2015 Templeton Prize. One of the most prestigious honors in the world, the Templeton Prize, has previously been awarded to Mother Teresa, Desmond Tutu, the Dalai Lama and others. Valued at £1.1 million (about $1.7 million or €1.5 million), the Prize is one of the world’s largest annual awards given to an individual and honors a living person who has made exceptional contributions to affirming life’s spiritual dimension, whether through insight, discovery, or practical works. Read more about this honor by clicking here. Jean Vanier was born on September 10th 1928, in Geneva, Switzerland, where his father, General Georges Vanier was a diplomat. He was educated for the most part in England. At the beginning the Second World War, the whole family including Jean, his sister and three brothers moved back to Canada. After two years, Jean, aged only 13, decided to enter the Royal Naval College in England. Aged just 16, while helping his mother in her work with the Red Cross, he witnessed the return of former concentration camp victims to Paris. In 1945, Jean began his career as an officer in the Royal Navy. But despite a promising career in the Navy, Jean found himself spending more and more time in prayer, reflecting on God’s call. Eventually, In 1950, he resigned from the Navy in order to study philosophy and theology at the Institut Catholique university in Paris. In 1963, after publishing his doctoral thesis on Aristotle, Jean returned to Canada to teach at the University of Toronto. While visiting his spiritual mentor, who was a priest in an institution in Trosly-Breuil in France, he was deeply moved by his first encounter with men with intellectual disabilities. In 1964, Jean took the decision to move to Trosly and, buying a small house, invited three people with an intellectual disability to join him. One of the men, Dany, left quickly, but Raphael Simi and Philippe Seux decided to stay. Jean named their house L’Arche, a reference to Noah’s Ark – a symbol both of security and of renewal. Very involved in the rapid growth of L’Arche at Trosly, Jean also began giving lectures and holding retreats around the world. In 1968, after a retreat in Ontario, he founded Faith and Sharing, communities created to meet and pray together each month. Three years later, along with Marie- Hélène Mathieu, Jean Vanier created Faith and Light, which was born out of a pilgrimage to Lourdes in France, for 12,000 people with and without intellectual disabilities, their friends and parents. At least once a month, this movement brings together groups of 15 to 40 people (children, teenagers or adults with intellectual disabilities, their families, friends) for a meeting of friendship, sharing, prayer and celebration. Jean Vanier is also the founder of Intercordia, an organization that encourages college students to live an inter-cultural experience among the poor and marginalized people in developing countries. 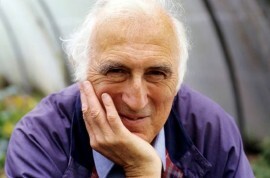 Jean Vanier has received numerous awards including the French Légion d’Honneur, the Companion of the Order of Canada, the Rabbi Gunther Plaut Humanitarian Award in 2001 and the Prize of the Catholic Theological Union in Chicago, as well as Blessed are the peace makers in 2006, and the Pacem in Terris award in 2013. Jean Vanier continues to give lectures and conduct retreats, mainly in his home community in Trosly. His books have been translated into 29 languages.